Posted August 15, 2016 by The Rapid & filed under In The Community. Every day, more than 9,000 people pass through Rapid Central Station on their way to work, errands and appointments. When was the last time you stopped to take in your surroundings while visiting Rapid Central Station? Rapid Central Station is The Rapid’s intermodal transit station located in downtown Grand Rapids. Steps away from the heart of the city, Central Station is steps away from many beloved destinations including Van Andel Arena and Founders Brewing Co. Built in 2004, Central Station was the world’s first LEED-certified transit facility. The Rapid’s fixed routes and the Silver Line travel to this hub. It’s also home to a Greyhound and Indian Trails terminal, as well as being located just yards from Grand Rapids’ Vernon J. Ehlers Amtrak Station. 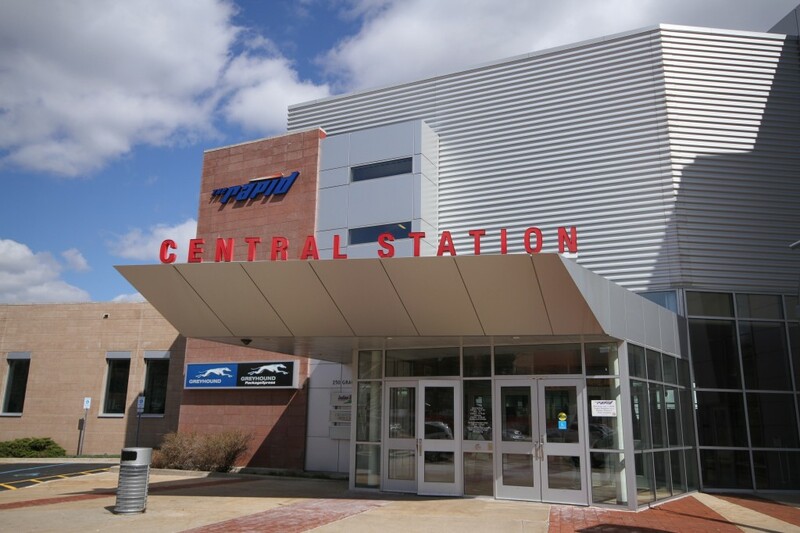 Some notable features of Rapid Central Station include the white undulating fiberglass roof of Rapid Central Station’s structure, which has become an eye-catching addition to the Grand Rapids skyline. Central Station also has a green LiveRoof and live wall. This intermodal bus station is also homes to a variety of art that ranges from sculptures to murals.